The Monster Jam World Finals XVIII will be held at Sam Boyd Stadium March 23-25, 2017. If you've never been,,,it's a must-see event. My kids are STILL talking about it nearly a year later. The excitement of the trucks racing and doing tricks is infectious and you'll find yourself cheering on your favorite Monster Jam truck. Fans can get up-close-and-personal with the Monster Jam trucks and drivers as they are granted more fan access to the stars of the show than any other live event. The World Finals XVIII is a culmination of the year's events featuring the top 32 Monster Jam trucks and drivers competing for the coveted titles of Racing World Champion and Freestyle World Champion. 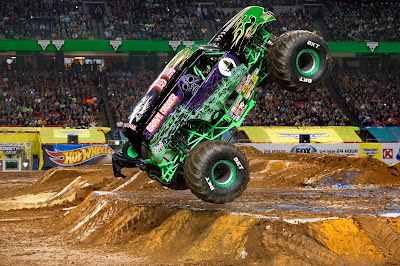 Witness Grave Digger as he tries to defend his crown against the greatest field of Monster Jam trucks ever assembled at Monster Jam World Finals. We are so lucky to have this event here in Vegas! Monster Jam competitors are trained at Monster Jam University where they master the skills of driving Monster Jam trucks. Approximately 12 feet tall and about 12 feet wide, Monster Jam trucks are custom-designed machines that sit atop 66-inch-tall tires and weigh a minimum of 10,000 pounds. Built for short, high-powered bursts of speed, Monster Jam trucks generate 1,500 to 2,000 horsepower and are capable of speeds of up to 100 miles per hour. Monster Jam trucks can fly up to 125 to 130 feet (a distance greater than 14 cars side by side) and up to 35 feet in the air. 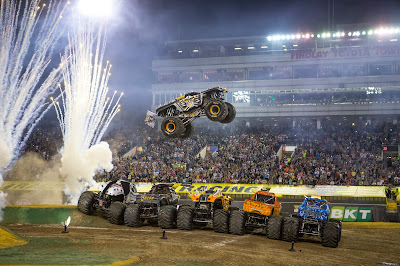 Last year, more than 57,000 fans with attendees from 15 different countries and all 50 states witnessed the greatest Monster Jam truck racing and freestyle competition in the history of the sport. 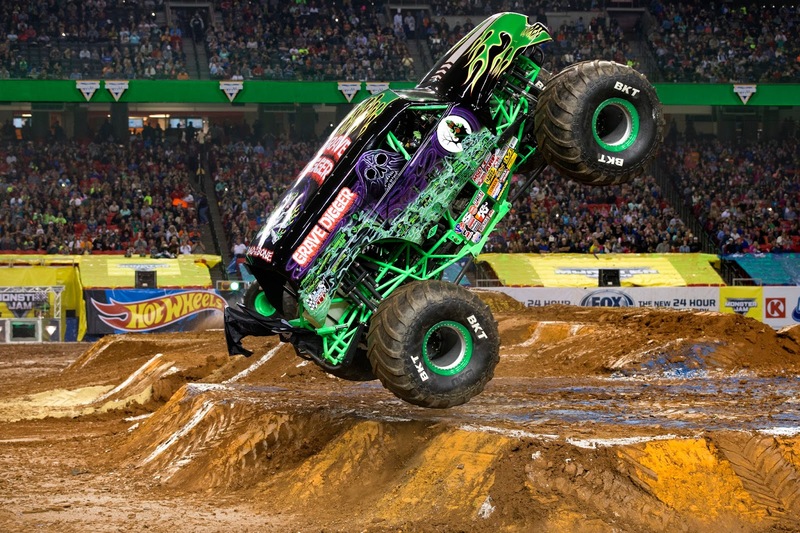 On Friday night at the Racing World Championship prepare to be on the edge of your seat as Grave Digger, Max D and the fastest fleet of Monster Jam trucks ever assembled go head to head in their quest for the Racing World Championship. On Saturday night the freestyle event is full of big air and big carnage. 32 Monster Trucks will battle it out featuring tricks and destruction like never seen before. Tickets are available now by calling 702-739-FANS, online at UNLVTickets.com, Sam Boyd Stadium and Thomas & Mack Center box offices, or UNLV Tickets outlets at La Bonita Supermarkets. 11:30am-5:00pm = The Thursday Pit Party is only open to fans that purchase the Double Down Package. Fans will be required to show their Double Down pass to enter. 11:30am-5:00pm = Party in the Pits, admission is free to all fans possessing a Friday and/or Saturday event ticket. Fans will be required to show their event ticket to enter. Don't miss this...this free event is so worth it. Here you can activate with the drivers, cars and so much more. There are vendor booths and you'll want to break out those pictures or something to get autographed. My boys love this part, it is just as good and free with your ticket! Tickets: Children 2 years and older require a ticket for entry. ***Additional fees and restrictions may apply to tickets and Double Down Packages. Get the kids excited with these FREE Coloring Sheets. Just click the links below and print! to the Friday, 3/24 Racing event including Party in the Pits. Winner must pick up tickets at will call and provide their own transportation to and from the venue. You must be 18 yrs old or older to enter. Contest ends 3/19/2017 at 11:59 PM PST. Just completed all posts. Good luck to me! Once again My Vegas Mommy...THANK YOU for these awesome raffles!!! Your excitement has me sold, sounds like a great time! My son loves grave digger! Such an awesome giveaway! Love this! My kids like Digger! Gravedigger is our family favorite! The best of the Best,Grave Digger!! My son loves Monster Mutt and Zombie!